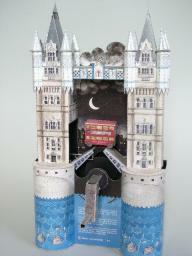 The model has been designed for the show "Tower Bridge Experience" in London. It describes an event from the year 1952. Then a red public service bus broke through the chain and raced towards the opening bridge. Miraculously the bus jumped over the gap and made a soft landing on the other side. Further informations about the model "Tower Bridge" and about three other cam controled models designed by Newstead you will get in my lecture on the 14. International Cardboard Modelers Convention in Bremerhaven/Germany 2002.